At about halfway point in this book I was at a 3.5 star rating. But now I can say a solid 4 stars. The rainy ghetto feel that Halcyon and her friends felt comfortable in. Oddly enough I actually enjoyed their nightly trips and all the rain and cracked sidewalks and abandoned buildings. It was so well done that I didn't really feel as it being a description, but more as just being there. The plot was also pretty good. It was a bit of a drag at first, but it didn't take too long to pick up the pace. Zoltan. I like this guy a lot. He's a bit annoying in regards to the fact that he was slightly a bum, always eating Rev's food and that one scene where he was acting like a cat... Otherwise, he was a very distinguished awesome character. The characters in general! There were 5 or 6 of them and at first I was boggled at their odd names, but not even 1/4 through I concluded easily tell them apart and recognize who was who. And I DO appreciate the interesting names. There wasn't really any major stuff that I didn't like. It was just a bunch of little things here and there that added up to taking off one star. First, I never actually connected with Halcyon. She's nice, a loner, which I sort of found appealing. She's a strong female character, I guess, without throwing punches at everything. I appreciated that she wasn't your cliche "I'm so insecure" girl, but she had her uncertainties. That was really refreshing. But I never actually connected wth her. I felt like we stumbled across her and just sort of clipped on to her to learn the story, but we don't really know anything about HER, which is why I'm excited to eventually read the sequel. I didn't understand why some of the extra character were there, like Pastor March, who doesn't seem to have had a purpose, and other little things, like why did their neighbors move out? I'm sure a lot of these things will clear up when I read the next book, so I'm excited to get it when it comes out! Thank you to the author for a free review copy. I'm really happy with it and I'm really glad I got to read this little gem. Now a little bonus... my brain took objects from everyday life that sort of impersonate each character, which is actually really fun. So I'm going to share it with you. Halcyon: she's a link of chains. Some of them are shiny and new and others rusty and old. They're all linked together and make up the whole of who she is. Zoltan: he's an albino peacock. It's not 100% crazy of an idea, but he's this mystery that's absolutely beautiful, and a little bit mischievous, but ultimately he's got a heart inside, just like everyone else. I love his heart. Reveille: she's a charm bracelet, the centerpiece being a sharp ninja star, but beside those there is a rainbow, a drone, a butterfly, and an envelope. Dorian: he is a piece of coal that fell of its car onto the railroad ties. He's gone through a lot and he's pretty much always struggling not to crumble. He's priceless but vulnerable and a little bit of a puzzle. I can't wait to learn more about him in the next book. Shep: he's a stray Aussie dog. But he likes his life as a stray. He mostly keeps to himself and by the looks of him you can't tell he's got a mansion he calls home. Post note: this is a Sci-fi for Christians. The gospel is non-existent in this story, it's assumed that the reader already knows what it means to be Christian and all about that. Just a thought I'd add. 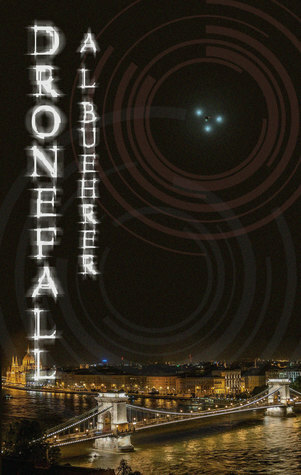 Sign into Goodreads to see if any of your friends have read Dronefall. 6.57% "Pretty interesting. Can't wait to read more. :D"
14.29% "This is getting pretty fun. There are some parts that drag just a bit. A lot of berries in this last chapter. But I'm sort of curious to read on. I already love Zolt. XD"
25.14% "I didn't love the Zoltan and cat thing, but otherwise I'm excited to keep reading. :D"
41.71% ""A smile accented his voice"
I'm going to have to use that expression. It's a lollipop."